Have you noticed? The leaves? and see the burst of color above my head. I used a program called Topaz to create the painterly affect on the photo. Fall colors tend to invite that sort of affect, I think. We've been traveling a bit so I hope to catch up with all of you soon! Also sharing with Moment in Time, Weekend Photo Challenge. What a wonderful, lovely post for the day and so very true! Love your delightful, colorful capture and beautiful words! I do love all the seasons as they each have a beauty all their own. Hope you have a lovely week, Reena! Enjoy! Just stunning, I think you have captured the heart of fall! Absolutely love this post! The processing is gorgeous and so is the poem. Brilliant souping up of the colours. I like your quote from Elizabeth Lawrence. Love the topaz effect. I really thought it was a painting. I hope my woods burst with color like that. The poetry is very fitting. Happy traveling. It looks like a painting. Are you familiar with canvas prints, for which this would be perfect! Stunning affects on the photo matched with beautiful, poetic work. Very Beautiful. Our leaves will be turning here very soon. Right now we still have a lot of green. Very well done, Reena. Leaves up here are still pretty green. Won't see much color until later on in October. There is hardly a more inspiring season than Autumn. I love the colors and the daily transformations I notice in my forest by the sea. How beautiful and creative! I'm excited for fall when I read post like this! What a beautiful photo.. I love your editing.. I so love this time of year..
Only some of our trees are turning. Took a ride north yesterday. The maples are being hit by the same blight or bug that got 'em last year. The leaves don't ever have a chance to change color because they curl in on themselves, turn brown, and die. It's so sad not to have color since we're stuck with the cold. Our leaves aren't very pretty at this point and I am wondering if Irene made them too brown to have much of a colorful autumn...hoping that doesn't happen! Lovely picture....we are just a tad behind you here in NC. Our dogwood leaves are getting an ever so slight tint of red on them...the hummer's days are number here. My notes from last year state we saw them up until Oct. 5. I'll miss those little jewels but look forward to the return of the fiesty Juncos. I like this soft painterly look. Fall is my favorite season. This is a lovely post and I love what you have done with this picture. Isn't autumn great. Nature is working her magic! 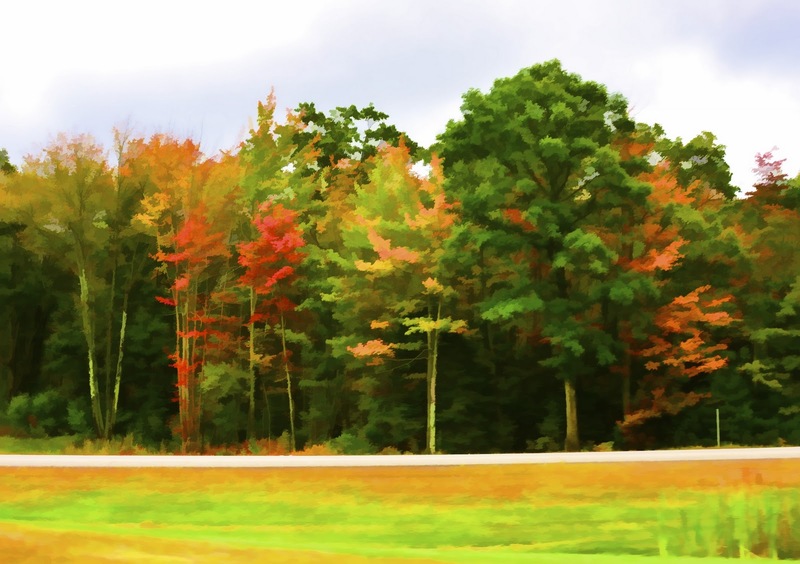 Wonderful poem, Reena, and I love your treatment of the colorful trees. it looks like a painting reena, a gorgeous painting. i love autum and i love this!! You are quite the artiste! I love that photo- it looks like a painting. 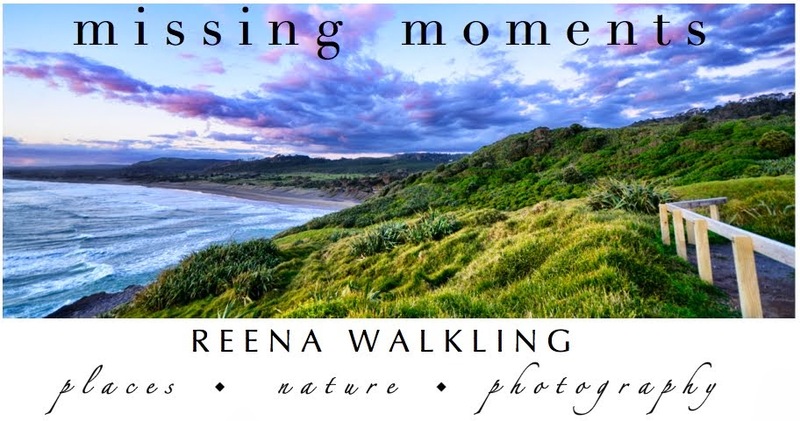 Great processing on that lovely image, Reena! The poem is beautiful. We are about a month away from any color here -- it's still 85 degrees! Wow.. Stunning work of art. I love your art as well as your poetry! Very nice, the both of them. I also appreciate your popping over from Lisa's. Thanks for your comments and for your visit...so much appreciated! Wow - this shot is just stunning! Thank you for your colorful gift. I'm really looking forward to the fall color changes, and i really missed all of this when i lived in Florida up to last year. For me the beauty of the north is un-matched and I'm just happy in being back home again. Richard from Amish Stories. Yeah, I see a bunch of leaves on the ground, but they have not yet turned their glorious hues. Lovely post. Cheers reena!! A beautiful image - so painterly. It would make a gorgeous print. We still have summer temps (!) but the leaves are gorgeous. Love the processing in your photo! I love what that program did for your picture. It does look just like a painting. We're not turning colors here, yet. Right along the shores of Lake Ontario, the color change always happens later. The lake modifies the temperature, keeping it warmer later in the year. Beautiful poem and painterly image! Lovely tribute to fall. So much loveliness in words and picture. Thank you. Beautiful post and picture! Love the watercolor feel to it. BEAUTIFUL! Amazing colours and lovely painting effect! Thank you so much for entering our challenge this week! Looking forward to more future entries from you! I am your newest follower. Beautiful poem and accomapnying words! It is always nice to meet a fellow photo/poet!